Milt “Pinky” Shoffner was destined to be a ballplayer. He was born on November 13, 1905, in Sherman Texas, the only child of minor league pitcher Herman Daniel Shoffner and Jessie Lee ( Combs) Shoffner. Herman played throughout Texas and Oklahoma for nearly a decade during which Milt was born. Herm taught Milt the game and we can only wonder what dreams the youngster had. Milt joked that his family were gypsies. They moved around during the baseball days, then went to Memphis where Herman had grown up. From there, they spent a few years in Aurora, Illinois, before finally settling down near Utica, New York. Herm worked in textile mills, usually as a loom fixer. Jessie Lee was a weaver. The work was good, but better yet for Herman, there were company ball teams to play on. He also spent time teaching the game to Milt. Milt attended high school near Utica where he was baseball team captain at age 15. A fine physical specimen at six foot one, Milt pitched, and played first base and the outfield. After his graduation, he considered going to college and was even recruited by Colgate. In the end, he passed on going to school and took a job in nearby Ilion. He played ball during the week for the Ilion Elks and hired himself out to local semi-pro teams on the weekends. Milt recalls that between the job and the game money he made $85-90 a week. During one of these weekend stints, Milt was scouted by Joe Birmingham who managed the Elmira team in the NY-Penn League and bird-dogged for the St. Louis Cardinals. Birmingham convinced Milt to sign with the Rochester Tribe of the International League. In the spring of 1926, Shoffner was told by George Stallings of Rochester (Class AA) to report to Bridgeport Bears (Class A) in the Eastern League. Bridgeport decided to go with experience over youth and gave Milt a pink slip, but failed to mention he should report back to George Stallings in Rochester. Shoffner thought he had been released so he went home. Stallings realized the mistake and sent Birmingham to Utica to iron things out. Joe explained the situation and Milt was sent to join the Grand Rapids Black Sox (Class B) of the Central League. Dormant since 1922, the Central League was revived in March of 1926, with three other teams besides Grand Rapids: Kalamazoo, Ludington, and Muskegon. The league began play in mid-May and Milt made his first appearance on the mound versus Ludington on Sunday, May 23. He surrendered six hits, walked four, and struck out six on the way to a 3-1 defeat. The Central League lasted about a month before it merged with the Michigan-Ontario League to form the Michigan State League. Shoffner held a regular spot in the rotation and also saw action as a right fielder. Baseball-Reference.com credits him with an 18-8 record for the Black Sox, who went 61-60 for the year. His performance earned a recall to Rochester where he appeared in two games with one decision. That came on September 13, when he started and went five innings in a 3-0 loss to Syracuse. Milt was rewarded with a spot on the Rochester roster in 1927 and a trip to Savannah, Ga. for spring training, where he was involved in a life-threatening incident. Pitching in Atlanta on March 27, Milt faced a batter named Frank Zoeller, who was known to crowd the plate. Milt threw inside, where Zoeller, leaning in, took the pitch off his head. Someone in the crowd, maybe a friend of Zoeller or just a wild crank, took great exception to an Atlanta player being plunked by a youngster like Shoffner. When Milt later left the game and headed for the clubhouse, he was met in the dark tunnel by this lone assailant and hit over the head, probably with a bat.i Milt lay unconscious in the tunnel for an inning or two before the Atlanta trainer found him. He was taken to a hospital with a broken skull and spent two weeks recuperating. His attacker was never brought to justice. Despite this incident, Milt enjoyed his 1927 season with Rochester. He was close enough to his parents that they could drive over and see his games. On the mound, he had limited success. He won 9 of 23 decisions with a 5.13 ERA. Control was an issue, he averaged over 4 walks per nine innings. The International League was shuffled the following winter and the franchise was shifted to Jersey City. Milt went 8-17 in 1928, with remarkably similar stats except that he dropped his ERA more than a run. He was regarded as an up and coming talent, especially since he was a lefty. Although Milt retired the Babe, Lou Gehrig, Tony Lazzeri, and Bill Dickey touched him up for hits and three runs in the ninth inning capping an 11-5 win for New York. He made 10 more appearances in the final two months of the season. Milt made three starts and tossed a complete game in a 4-1 loss to the Browns on October 6. He finished 2-3 and earned an invitation to spring training in 1930. He also picked up about $700 in bonus World Series money for the Tribe’s third place finish. The role of reliever and spot starter was handed to Milt for the 1930 season. According to Shoffner’s interview with Gene Murdock, GM Billy Evans considered Milt’s stuff to be the best of any lefty except Grove. In 24 games, 10 of them starts, he posted a 7.97 ERA, thanks largely to allowing an average of 13.5 hits and over 5 walks per 9 innings. He was also involved in a bizarre game on May 12 versus the Athletics. In that contest, the A’s jumped on Clint Brown in the second inning and he was yanked for Shoffner. Unknown to Milt, League President E.S. Barnard had made an issue of pitchers coming to an “appreciable pause” when in the set position. For reasons we will never know, umpire Brick Owens decided to enforce the rule that afternoon. In the third inning, Milt was called for three balks. He would only make one balk the rest of his career. Not to seem to be playing favorites, Owens also called a balk on A’s hurler George Earnshaw. 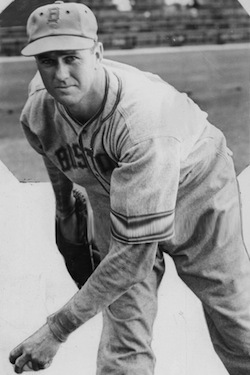 It was Earnshaw's only balk in a 300-game career. Manager Sam Peckinpaugh and the Cleveland brass still believed in Shoffner’s potential and brought him back for the 1931 campaign. It did not hurt Milt’s cause to be the only lefty on the staff. He appeared in relief with varying results until June 13 when he was given the start in the first game of a doubleheader with the Senators. He was sent to the showers in the second trailing 5-0. Shoffner fared better in his next start on June 29, picking up the win in a 15-6 slugfest win over the Yankees. The Cleveland Plain Dealer referred to Milt’s “potential”, and his “competent” pitching on numerous occasions, but the management finally gave up on him on July 21. He was shipped to Toledo and Sarge Connally was brought in to replace him. This move left the Tribe without a lefty on the staff. In his first start with Toledo, Milt lost to the Columbus Redbirds 6-4. He had no more success in the American Association than he had had in the American League. He was a woeful 1-6 with an ERA of 6.43. It was the low point of his career. The Depression was in full swing by 1932. Teams were cutting back, and 10 minor leagues had folded in recent years. Of the 19 remaining leagues, sixmore would disband during the year and three others had franchises fold. Milt went to spring training with the Tribe, but did not make the squad. Faced with the option of Toledo or Newark, Milt chose to go to Newark. In the back of his mind he saw a chance to join the Yankees. He made his first start on May 2 with a 7-3 win over Buffalo. He was, however, the odd man out when roster cutdown came. From the Bears he went south and joined Nashville. He made seven appearances from May 29 to June 22, five of them starts. Milt griped and moaned about the heat and humidity, and when his final start against Chattanooga lasted only 2/3 of an inning, he was released. His next stop was Albany of the Eastern League, where he pitched in six games and, owing to a 14-man roster, was used as a pinch-hitter and pinch-runner. His ERA was 2.51 and he found his control, issuing only nine walks in 43 innings. Unfortunately, the Eastern League disbanded on July 17. The Scranton Miners of the New York-Penn League were in last place and going nowhere, so they were happy to pick up Shoffner and others from the Eastern League. Milt’s first appearance for them was on July 27, when he beat Elmira 4-2. The Miners went on a tear and won 33 of 46 over the rest of the season. Milt sparkled with a 3.07 ERA and a 9-3 record. At the end of the season Scranton was in fourth place behind league champion and Keystone State neighbor Wilkes-Barre. A grudge match was set up after the season, Scranton claiming that they were the better team at that time. Shoffner helped the Miners to three wins of five games and was a town hero. Best of all, in the tough times, the victory earned him an extra $98. Milt found a baseball home with Scranton, and played there into the 1937 season. Over the previous winter he had gone on a hunting trip to upstate New York and met a pretty lady named Mary from Glen Falls. The couple wed while he was playing with Albany. They made their home in Utica until 1940 when they appear as residents of Sarasota, Florida in the city directory. When Milt was inducted into the military in 1942, he listed himself as separated. Milt and Mary had no children. Marriage did not seem to agree with Milt. There is evidence of other weddings in the mid-50’s, 1968 (Rogene), and the mid-70’s (Janice). None of them lasted very long. The Scranton campaigns were Milt’s finest. He won 84 games in the five seasons. The teams got steadily better and in 1935 they won the first half pennant, but dropped the playoffs in seven games to Binghamton. In 1936 they again won the first half, but this time they steamrolled over Elmira to the league championship. Sixth place was the best the Miners could do in 1937, but Milt still won 17 games. A Boston scout named Bob Coleman convinced the Boston Bees that Milt had something left in his arm. He joined Boston on September 8 and immediately started against the Phillies. He pitched possibly his finest major league game, twirling a three-hit shutout. Boston kept Milt for the 1938 campaign and he joined other minor league veterans to give the Bees an old, but effective pitching staff. He was 5-4 when he was struck with an appendix attack in June and forced to undergo surgery. He ended the season 8-7. He assumed the same role again in 1939 until he was waived in mid-season. The Cincinnati Reds were in the pennant race and needed a veteran lefty to solidify the staff. Milt was the answer. He joined the Reds on August 19 and saw action in 10 games, 3 of them as starter. He was not used in the World Series. In 1940, he again was the bullpen lefty, appearing 20 times, but never as a starter. Once again he saw no action in the postseason. That winter he was traded to the New York Giants. The Giants farmed him out to Jersey City and then to Memphis, where he posted a 7-9 record to close out his career. The army came calling in June of 1942, and he was put to work as a warrant officer. His hitch ended in late September 1945. Milt tried his hand at umpiring for the next few seasons. He started in the Eastern League in 1946 and in 1948 moved up to the International League. After the 1949 campaign, he was offered a contract without a raise and decided it was time to call it quits. He purchased a bar in Utica and named it Milt Shoffner’s Grill. He decorated the joint with photos from his playing days. He closed the bar down in 1953. Milt placed all of the photos and memorabilia in storage at a friend’s house. Unfortunately a fire destroyed everything. Shoffner moved to the Cleveland area, held various jobs and married and divorced three times. Madison in Lake County was his home when he passed away on January 19, 1978. Eugene Murdock’s interview with Shoffner. Available in the Cleveland Public Library and on its website in digital form. Newspaper sources included: The Sporting News, The Cleveland Plain Dealer, The Ludington (Michigan) Daily News. Online resources included numerous files at Ancestry.com and Milt’s info at Baseball-Reference.com and Retrosheet. Sources include numerous Reach and Sporting News Guides and The Encyclopedia of Minor League Baseball. i Shoffner was fuzzy about the events in Atlanta. He thinks Zoeller was looking for a curve ball and leaned into the fastball. Some accounts say Milt was found by fellow players, others say he was found by the Atlanta trainer who was coming from the clubhouse after taking care of Zoeller. ii As of late May 2012 the Nashville portion of Milt’s career does not appear in Baseball Reference. He was 0-4.
iii Milt remembers the deal as a couple of players, Dan Jessee and George Grant, and $65,000. The Plain Dealer from July 13, 1929, said the deal was for “George Grant and a bundle of money.” Other accounts published over the years set the money from $35,000 to $60,000. iv The Babe’s quote was taken from Milt’s interview with Eugene Murdock in 1974 which is available from the Cleveland Public Library.